That glass above looks innocent enough, doesn’t it? You think it might be filled with water, don’t you? Holy moly, it turns from clear to milky white in a flash. This far-from-innocent liquid is 106-proof Kubler Absinthe ($54). Yes, that rather mysterious high-octane spirit with the sordid history. 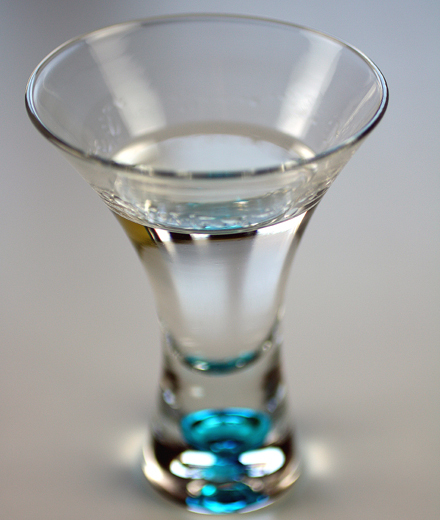 You might recall that absinthe had been illegal since 1912 because of supposed health concerns. It was thought that the chemical thujone, which is found in the herb wormwood (used in the making of absinthe), affected the brain. But that view has largely been debunked. Fortunately, for adventurous imbibers, the U.S. Alcohol and Tobacco Tax and Trade Bureau made it legal again in 2007. I’ve tried a couple of different absinthes since then. 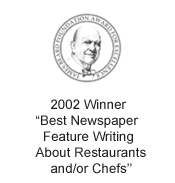 But I was most eager to try the Kubler one after a 2009 New York Times taste-test ranked it No. 1 among absinthes on the market. Because the spirit is so potent, it’s usually diluted with ice and sugar to mellow it a bit. 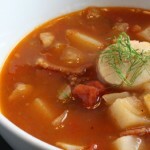 Admittedly, I am not a fan of black licorice, yet I love the taste of fresh fennel. Some absinthes are quite licorice-y tasting, while others are more floral and herbal in nature. 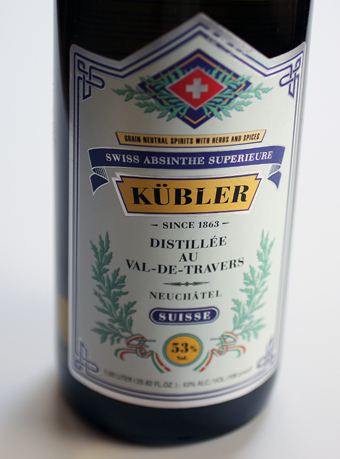 I tried a sample bottle of the Kubler, which has been made in Switzerland since 1875. Absinthe was invented in Switzerland in 1740 by a Swiss doctor who prescribed it to his patients. For a time, it also became banned in Switzerland. But in 2004, the Swiss government overturned that ban and the Kubler company went back into business using its original recipe. This particular liquor is distilled with wormwood, coriander, mint, anise and fennel. The Kubler has a pronounced medicinal, anise flavor, with the other herbs playing a much more secondary role. Indeed, it’s definitely one of the more licorice-like absinthes I’ve had. With ice, the flavor turns softer and mellower. Though still quite bold with licorice, it remains smooth and nicely balanced. Surprise your guests with shot glasses to try at your next dinner party as I’ve done in the past. It’s definitely a conversation-starter, a spirit that few may have had, but all will remember. Reminds me of ouzo. 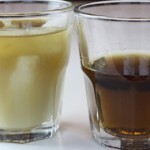 According to Wikipedia, this “ouzo effect” or spontaneous emulsification is caused when anise-flavored liqueur is mixed with water forming a micro-emulsion. Kind of like an oil and water reaction. The rest of the explanation was far too scientific for my left-slanted brain. I’ve never tried absinthe but it remains on my list…I have mixed feelings on black licorice but I bet I woiuld like this. Cool . . so informative, I had no idea. I’ve never tried absinthe, actually. 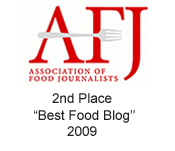 Heh heh, I also hate black licorice but love fennel. Well, it would sure get things going at the Superbowl party! I’ve yet to buy a bottle of absinthe to use at home, but I think it’s time I did! Are you sure all will remember? I cannot imagine I’d remember much of anything after 106 proof drink! Yikes! Sounds very dangerous to me. Delicious but deadly. Sophia: Wow, you’re good! “Spontaneous emulsification”! Who knew?? Thanks for the great explanation on the color change. Absinthe is amazing. Kubler is one of the best, but I’m dying to try one of the tiny handmade varieties ( like Delaware Phoenix in the NYT a while back) to see what the difference is. The coolest thing about absinthe is the presto change-o… and using an antique absinthe glass and spoon to drink it! Great post! Piee: You can find the Kubler Absinthe at BevMo. Might want to call ahead just to be sure it’s at the BevMo in your neighborhood or whether you might have to drive a little farther to a different BevMo to get your hands on it. I love the glasses. I’d drink anything that looked that pretty! Ah, happy memories. The first time I experienced this effect was when I sat down for snacks with my first girlfriend’s dad and his friends. 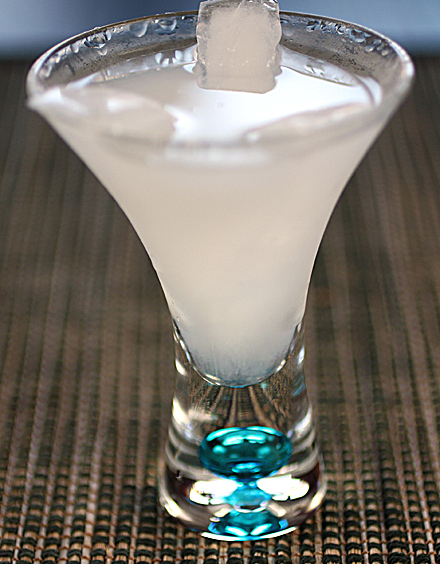 There is very little that could motivate me to drink a good Arak more than a room full of intimidating Lebanese men. In 2003 a Texas liquor importer named Dan Dotson began efforts to import absinthe from Kubler, a Swiss distillery. Because Kubler’s version of absinthe contained less than 10 parts per million of thujone, the element in wormwood that had kept absinthe off the market in the U.S. since 1912, it was given the green 🙂 light. But the agency insisted that while the beverage Kubler had produced was legal, the word absinthe (along with the variations absynthe, absente, and absinth) was an “illicit drug term” that could not be used on the labels. Eventually, the TTB softened its stance. Now absinthe can appear on the packaging, but only as a “fanciful term” modifying some other word. One can sell “absinthe verte” or “absinthe superieure”—but not plain old “absinthe.” And probably not “absinthe weed” either. Because of absinthe’s reputation as an illegal, mind-altering substance, the TTB continues to make marketing difficult for anyone interested in selling it. According to the FDA, alcoholic beverages must be thujone-free pursuant to 21 CFR 172.510. 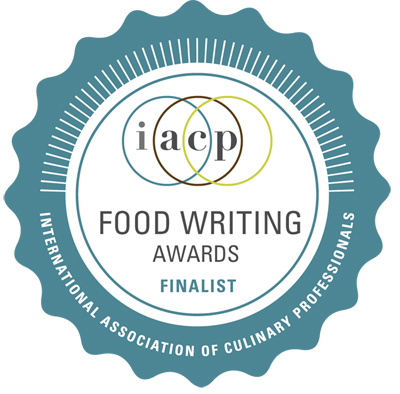 The term “absinthe” may not stand alone on the label; it must be accompanied by additional or dispelling information..
Dear FoodGal, this is the first time I have visited your site and it is exceptional. I saw this post on Absinthe and was so excited to find someone else had written about it as well! I wanted to share something with you. What foods would one pair with Absinthe? Your insight and suggestions would be most insightful. 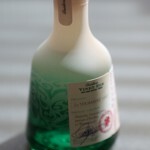 My first brush with absinthe was back in 2006 when I visited Germany for the world cup. like everything else about that trip.. great memories. Gaby: “Drink three to five of these…”???? I think I would never walk again if I did that. Hah. As for food pairings, I think the simpler the better. Absinthe has such a bold, pronounced taste that it’s not easy finding dishes that don’t clash or aren’t overwhelmed by it. The first time I tried Absinthe, I actually had it with oysters on the half shell. That worked pretty well, too, because the oysters have such a clean, bracing quality that let the Absinthe still shine through. While I would love to try Absinthe, I’m easily knocked out by straight spirits. Perhaps I’ll start slowly – those absinthe-enhanced recipes sound wonderful. 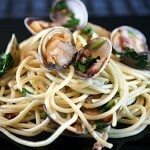 Drunken Clams and Noodle are a good match!